ysabetwordsmith | Poem: "Fear into Freedom"
This poem was written on commission for dialecticdreamer. It also fills the "Nurture Self-Worth" square in my 8-1-15 card for the As You Like It Bingo fest. It belongs to the Danso & Family thread of the Polychrome Heroics series, and it's the first of a triptych, so posting this unlocks "An Even Brighter Path" for possible sponsorship. Nathaniel balanced on his hip. scampered in circles around them. Hannah had Rosita in a baby sling. and various other attractions to enjoy. into a patch of shadowy undergrowth. "Hey, what's that?" Lakia said. "It looks like a box. With eyes!" "That's a tweenbot," said Hannah. "It must have been exploring." Danso took a closer look. a rounded torso and a cute face. to make the short body more visible. peeping in dismay as the little wheels spun. "Who does it belong to?" Hadyn asked. or a private owner," Hannah said. "I don't see a nametag," Danso said. "What's it even doing out here?" to see how other people will respond. It's a live experiment in civic interactions,"
Hannah explained, looking at them. carry out this plan. "That doesn't sound very nice,"
Hannah said. "Let's think of other things we could do." "We could leave it alone," Hadyn said. "Yes, we could," Hannah agreed. "You said it was exploring,"
Danso mused. "Where's it going?" "I don't know, but we can find out," Hannah said. "Tweenbot, where are you going?" "I am going to Peterson Park,"
"We should help it," Danso said. Helping others made him feel good. waving him toward the tweenbot. "Is it yummy?" Nathaniel asked. put the tweenbot on the sidewalk. you need to go west. Good luck!" "Thank you, citizen," the tweenbot chirped. A lens flickered as it took a picture. of you kids for figuring out what to do." "Even though I said to stomp it?" Lakia said in a low voice. the tweenbot by discussing options together. That's always a good accomplishment." about yourself, and transform fear into freedom. "I've learned that fear limits you and your vision. It serves as blinders to what may be just a few steps down the road for you. The journey is valuable, but believing in your talents, your abilities, and your self-worth can empower you to walk down an even brighter path. Transforming fear into freedom -- how great is that?" 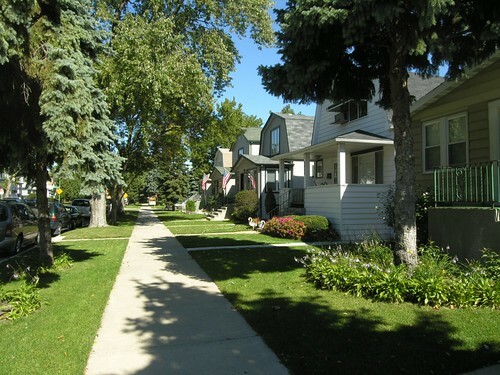 North Park is a quiet neighborhood in Chicago with several nice parks. Hollywood Park is a small park with a rich history in the neighborhood, and you can read more about it online. Peterson Park is larger and has some good amenities. This map shows Chicago parks with staffed facilities. Compare it with Chicago neighborhoods and this colorized map showing respective affluence. You can see how Local-Chicago has greatly polarized from middle class and working class to wealthy and impoverished. Terramagne-Chicago has much less of an income gap and its neighborhoods mix around more, although there are still some better and worse ones. T-Chicago belongs to the wider metroplex of Onion City, so connects with a very wide urban area. Here is a look at the trees and sidewalks in Hollywood Park. Tweenbots are small, simple robots used to study human behavior by observing how humans interact with robots. You can make your own. Here are some ideas for games and experiments. 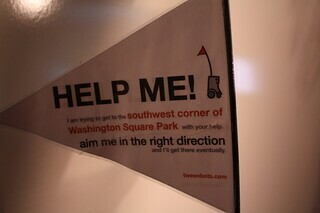 L-American tweenbots have instructions printed on a flag. In Terramagne they typically have a simple voice interface. HitchBOT was a robot that previously crossed Canada and visited various places in Europe before coming to L-America. Sadly, it was beaten to death after just two weeks. The vandal(s) decapitated it and tore off the arms. This says some very unsettling things about America. Then there's this downright disturbing rant about how "HitchBOT was a literal pile of trash and got what it deserved." There are kits to build your own robot, although most of them don't actually do anything. Recycled Robots uses cardboard and other found items. Find & Make Robot Kit consists primarily of joiners and other tools, again with an emphasis on cardboard. The Trash Robot Kit works in metal and plastic. These could easily be modified to roll forward, which is all the basic tweenbot does. ZURI is a programmable robot with a dozen possible variations in its cardboard body, currently in prototype. Here are some general instructions for robot design. Abused and/or neglected children show a tendency to catastrophize due to adults reacting all out of proportion to typical childhood mishaps. Even after being fostered or adopted into a healthier family, it takes time for them to adapt and change the narratives. Here you can see that Lakia isn't quite there yet, but is making enough progress to pay attention to Hannah's positive modeling. Self-worth is necessary for health and happiness. It is based on practical awareness of intrinsic worth plus personal skills and virtues, rather than the more social aspect of self-esteem which needn't have a solid foundation. There are ways to build self-worth and teach it to young people. Spending time with family, learning new things, and exercising virtues such as compassion or helpfulness are all ways to increase a sense of self-worth. there is something immensely satisfying about a simple little moment which builds community ties. I love that Helen is taking the kids outside the usual walking-distance park. We did something similar, though more as a monthly novelty than a weekly one. It's hours worth of "Read the attractions and decide where to start," and "The slides are on the south side of the park. Where is that from here?" and "Here is a busker? What do we do with buskers? Smile, say hi, drop a tip in the hat." Heavy-duty practice in life skills for kids who didn't get much of that earlier, to fill in the gaps. Moving around makes it work better. Doing it more often gives them more chance to catch up through extra practice. For kids in a healthy home, a special outing once a month is about right. But there's another secret ingredient, and that's the built-up public transport in Terramagne America. It's not much harder for them to visit parks in a different neighborhood than their own. Even the places that stuck far from public transport have often cobbled up something of their own, like Skylark Apartment sending their shuttlebus to a different attraction each weekend. Cheap, fast, easy, accessible, and fun -- so people use it a lot. It's interesting that you show Hannah teaching the kids the solutions she knows. I had to first figure out a solution, THEN I could test it and eventually teach the boys. I still have no idea what the "everyday" etiquette is for street buskers; I was raised by people whose immediate response was "get a job." My personal solution is to smile always, say "Thank you," and tip if I have money. But I had no clue at Danso's age that there WAS any other response to street buskers except to actively pretend they were invisible. Is there a wide cultural variation depending on where someone lives in T-America? New York or Seattle versus Joplin, Missouri or Kansas City, Kansas? I'm always curious, but now it's spinning in terms of micro-cultures, or regional ones. She is, but she's also open to their different experiences and personalities. That's what happens when people don't learn something growing up. That's a typical courtesy response, yes. >>Is there a wide cultural variation depending on where someone lives in T-America? New York or Seattle versus Joplin, Missouri or Kansas City, Kansas? There is some variation. On the whole, Terramagne-America is much more supportive of the arts than Local-America is. They put more money into it from school on up to funding public works. People have better jobs and benefits, so they have more money to spend on things like piano lessons for the kids and tipping buskers. So they get more street art, which brightens up travel and encourages people to interact. Everyone wins. They just don't handle it exactly the same. Westbord, Easy City, and Onion City are downright enthusiastic about busking. Up in Rain City it's more on ferries than street corners. Some in Eastbord but not as much. The Heights is stuffier. Some places actively encourage it. In Westbord and Easy City, people will stop and jam with a busker. Both of them, plus Onion City, hire some buskers for their biggest parks and attractions -- but Westbord handpicks their best performers for those slots, Onion City fills theirs by lottery from everyone with a busking permit, while Easy City doesn't require permits and just lets performers sort out their own spots as long as they don't block traffic. Onion City, and some parts of Eastbord that are a little more busker-friendly, have shelters for them or even pavilions for a performer and audience, to cope with the worse weather. They're easy to mistake for bus stops or ordinary park pavilions until you look closely at the seating arrangement -- there's one offset from all the others. Some places that don't have regular buskers will still do street fairs, like in Eastbord. The content varies too. Easy City is known for jazz/blues and portrait artists. Motor City is known for jazz/blues and metal sculptors. Eastboard, Westbord, and Onion City all get a lot of street art in terms of speedpainters working with spraypaint on small canvas, drywall, or building walls. Rain City and Westboard are heavily known for beachcrafts, people who make things while you watch and sell it, like beach glass hair clips. Rain City actually responded to complaints about beachcombers overpicking public beaches by designating one as Tumble Beach. Every year they add a couple truckloads of fresh crushed glass, and artists can buy a permit to go pick up whatever they want. Then of course there are people who perform with superpowers, which is pretty snugly matched to how popular or unpopular soups are in that area. Easy City gets a lot precisely because they don't charge for permits, so it's a job any soup can just walk out and DO. Whether they're good enough to earn anything is a different story, of course, and they don't get the benefits that some of the permit programs offer, like tax receipts and a health insurance option. A lot of them are crayon soups, or people whose powers are basically decorative. It's a way of showing people that superpowers are normal and cool. Oh, wow, now you've got me wondering if there are a couple of high schoolers supplementing their income by busking in Mercedes. In a town that small, the busking permit is more like "I'm not so out of resources I can't scrape up the permit fee," but it would have perks suited to the area - perhaps showing the busker's permit would let them use public transportation for free, akin to the bus pass included in my last two jury duty summmons? It's probably no more than the $10-20 typical of passes to many facilities that don't make heavy use of supplies, and probably free for anyone in the 13-18 age range. Cities with more expensive permits usually have either a sliding scale overall, or they block out different regions so the highest-tourist-traffic places have expensive permits (thus favoring more successful buskers) while lower-traffic areas are cheaper. Exactly. T-American mass transit is so heavily subsidized that cities can afford to give away free passes pretty easily. Some places you get a free ride on local transit and a discount on the longer-range ones. A lot of local businesses will offer freebies or discounts to buskers too. It's pretty common to see them with logo clothing, umbrellas, etc. especially in exchange for playing a set out front of the store or restaurant. *chuckle* Or at the nearest corner, where playing food songs will make people think of eating at the restaurants as they're walking along. If the permit is an annual thing-- $20 would cover A LOT of access to specialty services. (Like being able to access the same kind of collection my county library has, very old sheet music, and a folk music collection which isn't being digitized from 78s or even odder forms, most of which was actually shifted to the county museum during budget cuts. A busking permit is annual in most locales. Some of the places with extreme weather may offer a seasonal option instead of or alongside the annual, if it's unpopular or unsafe to go busking in frigid or broiling weather. Others just move it indoors to malls, bus stations, etc. but the indoor option usually hikes the price considerably since space is more limited and tastes more prone to conflict -- you have to factor those into the cost. Typically there is a union/guild/whatever of buskers for each city that has a sizable population of them, which handles the collective needs, processes permits, offers professional enrichment, etc. They usually do have a library of resources. The bigger ones have a library of tools where you can "check out" a guitar or whatever. Lakia is lucky to have Danso and Hannah in her life. I hope that the good examples outweigh the bad ones as she gets older. Sooth. It's helping a lot.